Kebabs are basically Middle Eastern dishes that were once based on grilled meat and vegetables that were threaded on skewers. But these days those skewers can be filled with a wide variety of foods for delicious combinations and a fun presentation. Instead of the traditional falafel sandwich in a pita, why not grill or roast vegetables and serve them on skewers along with the falafel balls? It's a tasty and healthy idea that would make for a fun lunch box item when the kids go back to school. Just pack up a little tahini sauce to drizzle over top and enjoy! Make the falafel by adding the chickpeas, onion, garlic, cilantro or parsley, ground cumin, baking powder, salt, black pepper, flour and red pepper flakes, if using. Puree until the mixture is mostly smooth but it does not need to be completely smooth. Refrigerate for at about 15 minutes. While the falafel base is cooling in the fridge, make the tahini by combining the sesame paste, water, lemon juice, grated garlic, salt and pepper in a bowl. Pre-heat the oven to 400 F. Toss the onion, bell pepper and tomatoes in the olive oil and season with salt and pepper. Spread out on a baking sheet lined with parchment paper and roast in the oven for about 30 minutes or until softened and lightly browned. Add the two tablespoons of oil to a second sheet pan lined with parchment paper. Form the falafel into balls, approximately 1 ounce each (we used a cookie scoop) and gently roll them in the oil and place on the pan. Bake in the oven for 20 to 30 minutes or until the balls are a light golden brown. 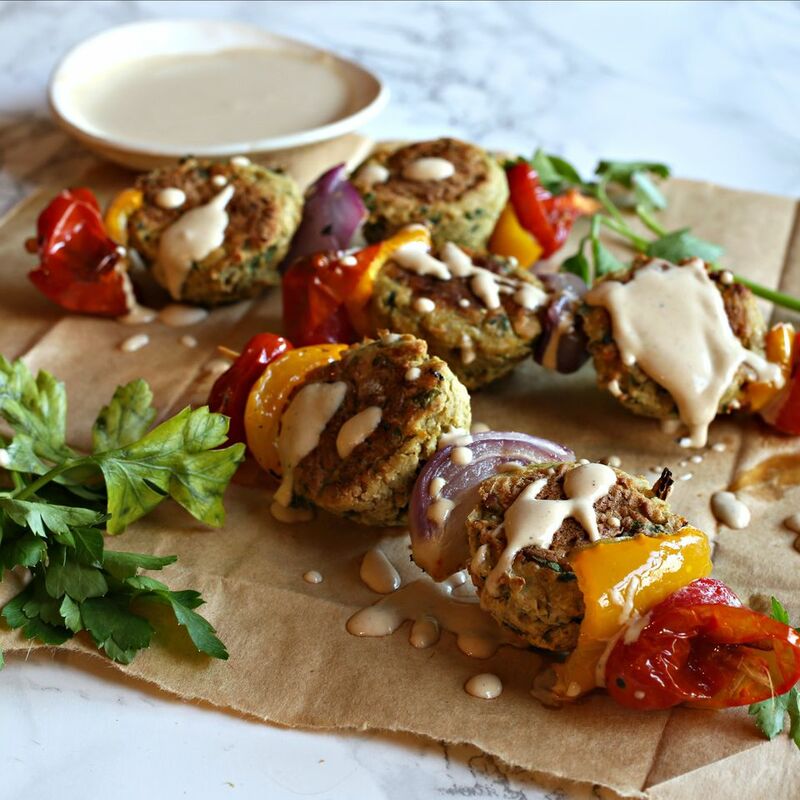 Prepare the kebabs by alternating pieces of vegetables with falafel balls and drizzle with the tahini sauce.